Home / audie gemora / ayala land / ayala triangle garden / concert / free concert / karylle / love triangle at the gardens / makati city / valentines' day / Celebrate Seasons of Love at Ayala Triangle! 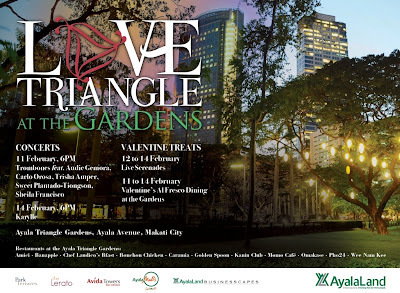 Celebrate Seasons of Love at Ayala Triangle! To all Valentine's Day suckers out there who are on a very, very tight budget or just simply broke, but in a truly, madly, deeply in love state of mind, body and soul, Ayala Triangle Garden with its mother company, Ayala Land, and the City of Makati, will be giving you and your love one a "love triangle" affair that both of you will definitely enjoy - Love Triangle at the Gardens - a Valentine concert treat for FREE! Be mesmerized as the Trombones fills Ayala Triangle Garden with love together with Philippine's top performing artists like Audie Gemora, Carlo Orosa, Trisha Amper, Sweet Plantado-Tiongson and Sheila Francisco on February 11th, Friday. And on February 14th, Valentine's Day, sing your heart out together with Karylle as she shares her beautiful voice by serenading couples and soon-to-be-couples with our all-time favourite love songs. There will be more Valentine treats from February 12th to 14th as live serenades will fill the air of The Garden right under the twinkling of those beautiful lights and stars. For those who have spare money on those days, you may enjoy a moonlit dinner with the Al Fresco Dining from the Garden's authentic restaurants - Amici, Banapple, Chef Laudico's Bfast, Bonchon Chicken, Caramia, Golden Spoon, Kanin Club, Momo Cafe, Omakase, Pho24 and Wee Nam Kee.